Welcome to the second week of 2017’s Burger Month here on 3rd World Geeks. Now, while gourmet burgers have been gaining some popularity in the Philippines, I can’t really say that my favorite food hasn’t been a staple in a lot of restaurants. There have always been a lot of places where you can get gourmet burgers before and not just in specialty restaurants that prominently feature burgers on their menu. This week, I decided to focus on one of those places: Eat City. The word “City” is inside that red circle. Trust me. 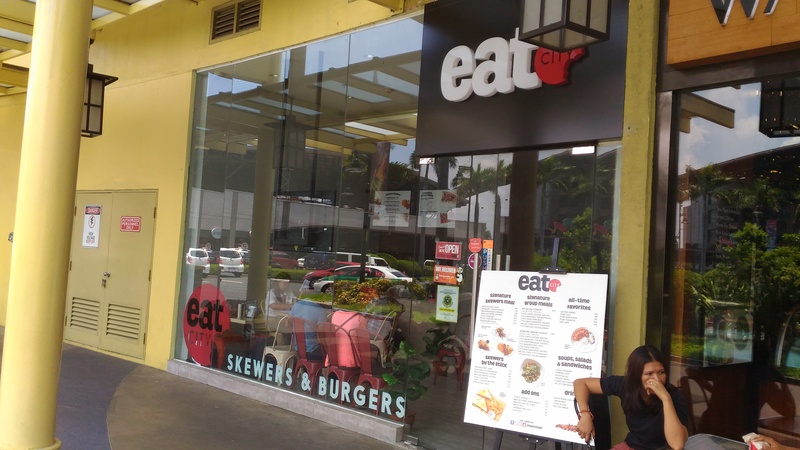 Eat City is actually located at the front of Serendra, facing Market! Market! It’s a rather quaint little place that doesn’t really focus on burgers. Rather, the place does serve meat skewers. I have eaten the skewers here a few months ago and they are pretty good. But, after perusing the menu a little bit deeper, I did notice that Eat City also serves burgers. I took a mental note of this so that I could try it out for Burger Month. And… here we are! There were a couple of things that caught my attention when I saw how the menu described the Eat City Breakfast Burger. First, it had the word Angus when describing the beef. While the gold standard in beef is still going to be the succulent Wagyu label, I will say that Angus comes a close second. There’s a pedigree that comes with the label so it made me want to try it much more. Also, instead of using “regular” hamburger buns, Eat City uses “black buns.” Now, how this will affect the taste of their Breakfast Burger, I wouldn’t know. But my curiosity for it made me want to try it even more! Oh, and since it was a Breakfast Burger, it would come with a fried egg. I’ve never really adding a fried egg to my gourmet burger before, but there’s a first time for everything, right? 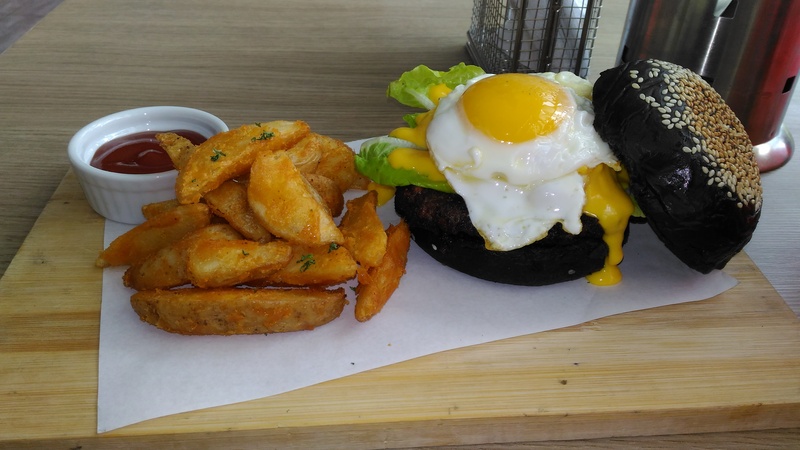 When I ordered the Eat City Breakfast Burger, I guess I was too enamored by the description of it being an Angus beef patty, with lettuce, tomatoes, fried egg and cheese sauce, served in a “black bun,” that I failed to notice that it came with a side of potato wedges. So, when I did get my order, it was a welcome surprise to see a neat stack of fried potatoes next to the burger. I will commend Eat City for using a rather simple yet really well made presentation for the Breakfast Burger with potato wedges. Look at that cheese sauce dripping down the side! The first thing I actually did was take a good look at the black bun. I honestly thought it would be unappetizing to look at since, well, it doesn’t look like your regular bun. I meant to ask why the bun was colored this way but I forgot. I will say that it does seem like the “blackness” does serve a purpose: it makes the outer shell rather crusty, giving the bun a rather solid feel. It’s still felt soft on the inside but the “shell” still felt solid. The next thing I did was look at the fried egg and this got me a bit worried. My issue was the yolk wasn’t solid. It was still runny and it looked like it would be a problem because it would add more liquid to the burger. If you look at the pictures I took of the Breakfast Burger itself, it already has a good amount of cheese sauce. The runny egg will just make it too much. I think it wouldn’t be a problem if it was cooked over easy so that the yolk could solidify a little but that’s not what I got. Good looking fried egg, though. And, guess what? One of my greatest fears regarding the “too much liquid” on the Breakfast Burger came through. The instant I bit… well, tried to bite into it… the entire thing just exploded in my hands. I already knew something like this was going to happen the instant I stuck the top part of the black bun on the burger as I couldn’t get a firm handle on it. Essentially, when I put the bun on the top of the burger and the egg, the yolk started leaking, which made the entire thing feel really slippery. So, the mere pressure of sinking my teeth into the Breakfast Burger caused its contents to come flying out. However, I will say that, wow! Eat City’s Breakfast Burger tasted really good. It was much better than I expected it to be, especially if you consider that Eat City doesn’t even specialize on burgers. The beef patty was exceptionally good as there was a tenderness to it that was just fantastic. It wasn’t super juicy that the liquid fat would run all over your hands (even though my hands were a mess because of the aforementioned burger explosion) but you still could taste how succulent it is. 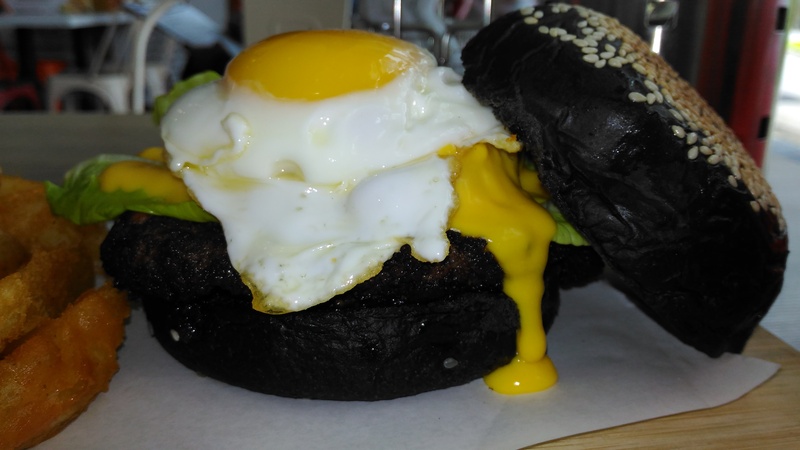 And even though the entire Breakfast Burger collapsed, the black bun didn’t. It kept its integrity even after that. Suffice to say, Eat City’s Breakfast Burger was great. But I will say that some of the joy of eating it was definitely taken away because I had to eat it with a fork and a knife. No self respecting burger lover would ever eat a burger with a fork and knife but this was what I was reduced to because it blew up in my hands. 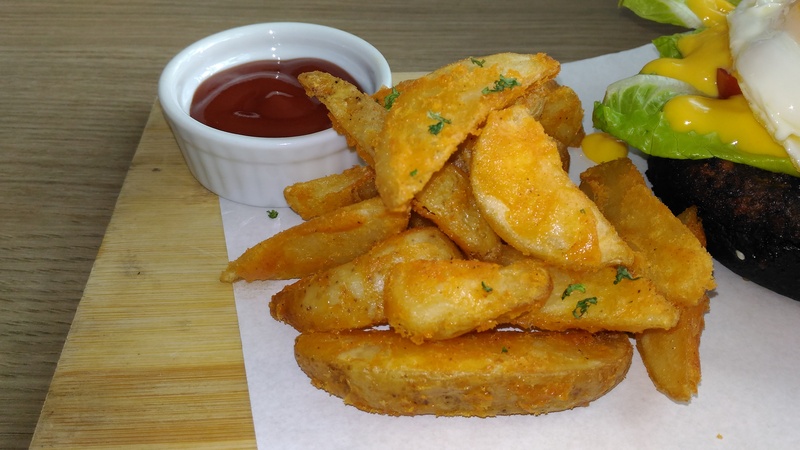 Of course, since it did come with a side of potato wedges, I have to talk about them as well. I will say that they were pleasantly good as well. They were nicely seasoned and they were seasoned really well. They didn’t just dump a batch of potato wedges in hot oil and call it a day. No, Eat City apparently uses a kind of breading on them, much like the way Shakey’s does their signature Mojo potatoes. I wouldn’t mind just ordering them by themselves; they’re that good. Better than your average french fries. All-in-all, I was really surprised at how good Eat City’s Breakfast Burger was. It was definitely much better than a lot of the other burgers I’ve tried over the years of doing Burger Month. I will say that the fried egg felt like overkill because it was probably the reason why it just came apart while I was eating it. Maybe if you ask them to cook it over easy or just have them set it to the side, it would’ve been much better. Still, even with that humongous problem, I would still highly recommend Eat City’s Breakfast Burger, even if you do have to eat it with a fork and a knife. Have you tried Eat City’s Breakfast Burger? What did you think of it? Let me know in the comments section below!